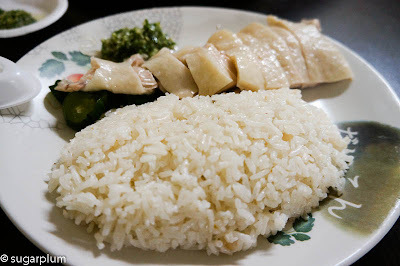 I used to think that Singapore had the best Hainanese chicken rice around. Singapore does a pretty good job branding their chicken rice, so you get the likes of Boon Tong Kee and 5 Star branches everywhere. And even the single outlets like Tian Tian and the used-to-be good Chatterbox @ Mandarin Hotel generated passionate discussions and legions of loyal fans. Then I went to Taipei. 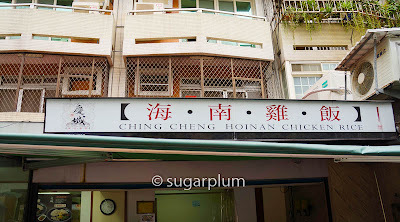 It was the last place I'd expected to find chicken rice - a hole in the wall, literally. Big Dog had stumbled upon it during one his sojourns to Taipei. When we first ate there, it was a hut sandwiched between 2 shops. In winter, you'd eat quickly and vamoose because you're dining alfresco freezing your toes off. No heating, no frills. You pay, eat and go. Chop chop. Business must have been good because a year later, they'd upgraded to a proper shop. Luckily for us, it was still in the vicinity when we went back for a visit and we found it easily. 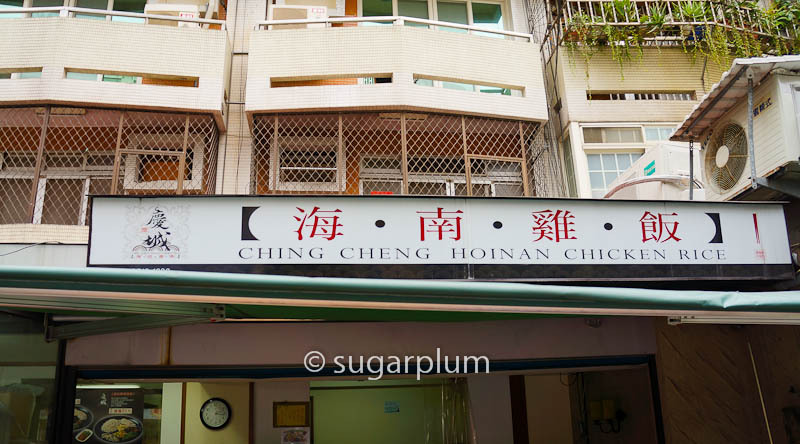 So what do you get at Ching Cheng Hoinan Chicken Rice? The smoothest, tenderest, poached chicken with an awesomely flavoured rice. Rice cooked to perfection with each individual grain loose and fluffy. Not sticky or clumpy. You can taste the chicken stock, fat and the merest hint of garlic in the rice. The chicken is served plain - no sauce, no garnishing to distract. Smooth, smooth, smooth - even the white meat was tender. ﻿What do you not get? Unlike Malaysian and Singaporean versions, they don't serve it with chilli or soy sauce. Instead you get the most piquant minced ginger-spring onion dip on the side. Be prepared that the dish isn't piping hot - the rice is warm, the chicken and sides are room temperature. The only piping hot dish is the free soup simmering away in the corner which you help yourself to. You have a choice of small or large portions. Small (NT65) comes with just rice and chicken. Large (NT85) gets you additional sides of omelet and stir-fried vegetables. Oh - you are expected to clear your own tray after eating - just like in McDonald's. There aren't any cheap foreign labour or amahs to clean up after you here. Hainanese chicken rice is a dish which Chinese immigrants brought across with them to Malaysia and Singapore. 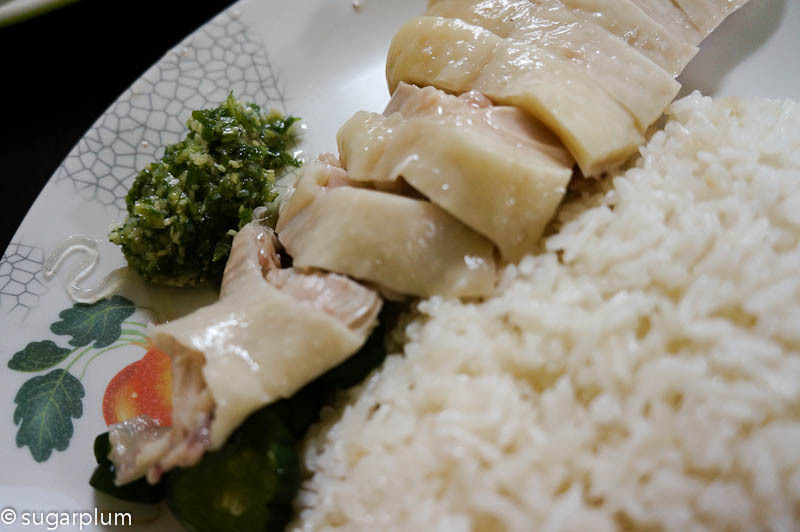 When I was in Hainan island, I was hard put to find Hainanese chicken rice like the ones back home - I found wengchang chicken instead. 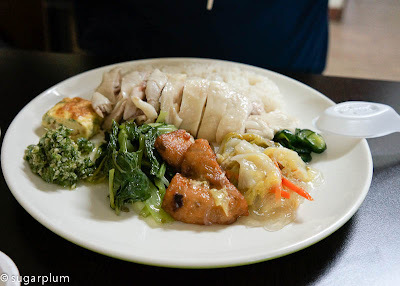 Just like you'll never find Hokkien Mee in Fujien or Singapore Fried Noodles in Singapore, Hainanese chicken rice is a dish which has evolved and taken on local influences over the years. Most Taiwanese speak the Hokkien dialect, or Min Nang hua, so conversing and ordering wasn't difficult even with our limited Mandarin. In fact the wait staff were pretty delighted and amazed that we could speak in Hokkien (we were obviously not local and not from mainland China). Take the MTR to Nanjing East Station and exit Qingcheng Street. You will see Brother Hotel on your right. Keep the hotel to your right. Walk down Qingcheng Street towards McDonald's, pass Les Suite Taipei and Movenpick. Turn right into the lane when you see Hooters. The shop is on the right side, opposite Friends Pharmacy. All your Taiwan posts are making me so hungry! We have to try to make a trip there soon! :) made me hungry too as I was writting the posts.